Fall is my favorite, favorite season! Beside the colors, the crisp air, the food, and the clothes…I also love the feelings of renewal and purpose I get at this time of year. 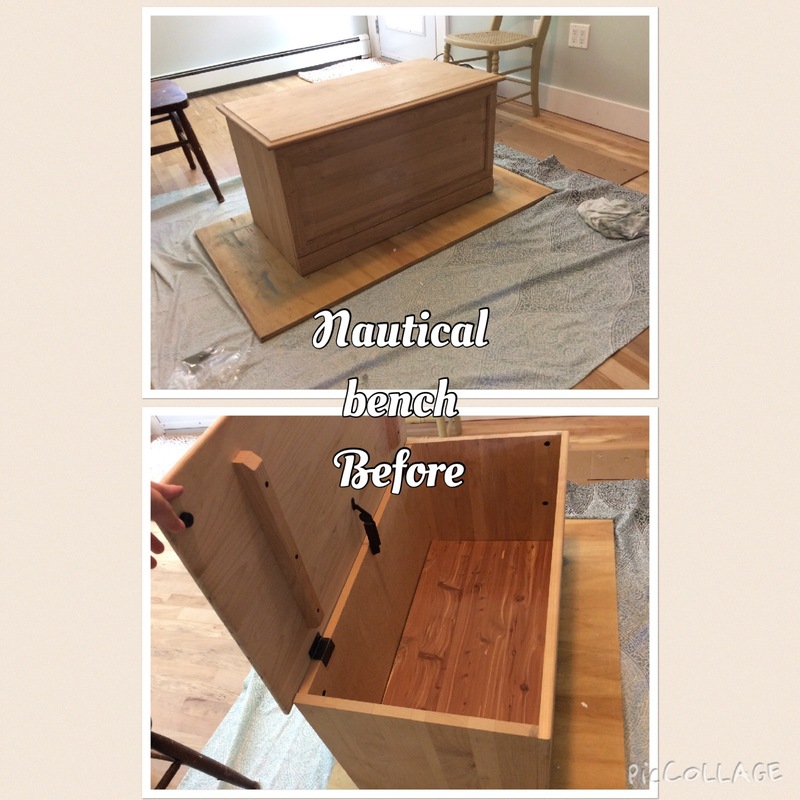 I am new at DIY, Blogging, and furniture upcycling, and so having “just started” in August, I’ve been learning a lot about how fast I can work. The planning stages of a project take me for.ev.er right now (what piece, what color, what finish, etc., etc., etc.,) but once I actually get going I’m pretty quick. 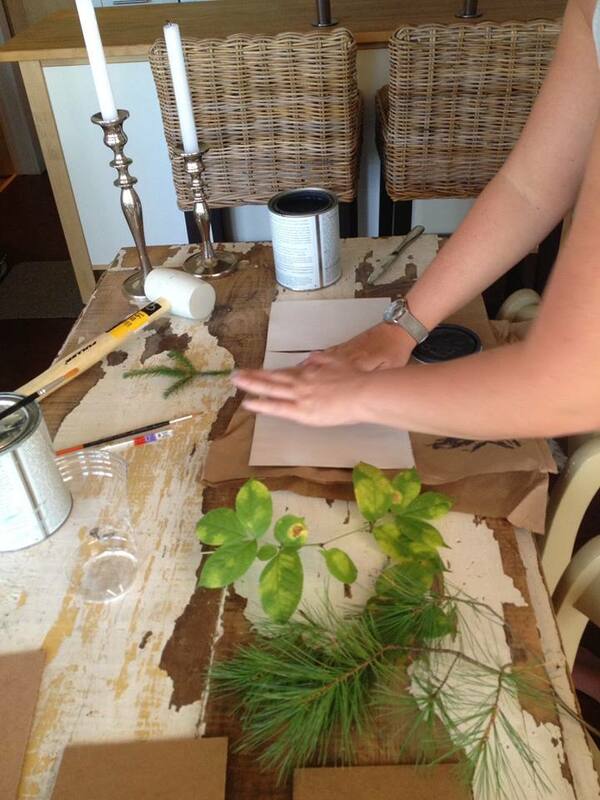 In August, I thought I was going to be make 20 or so fall décor signs and bring them to a craft show. Ha! I’ve learned that TIME FLIES when you’re slow. 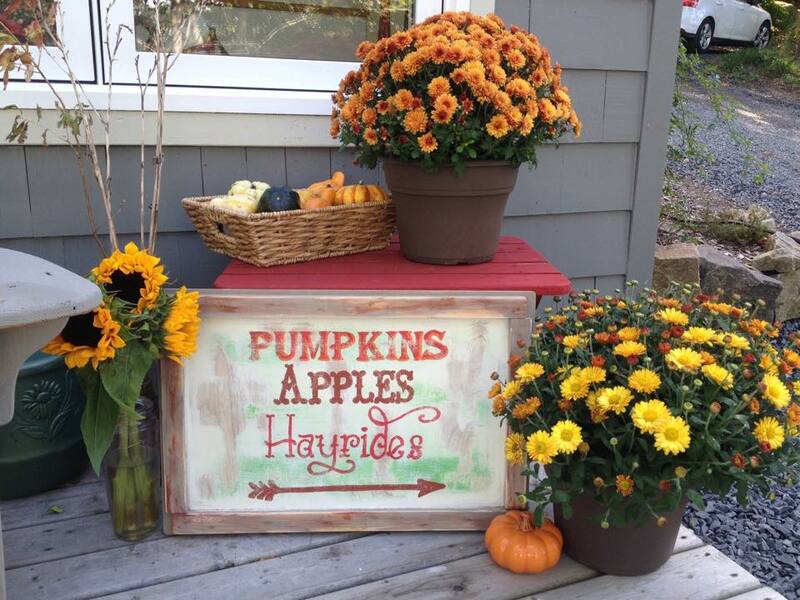 Next year, I’ll need to start my “20 or so fall décor signs” in May, to have them ready and waiting for the Fall season…lesson learned! 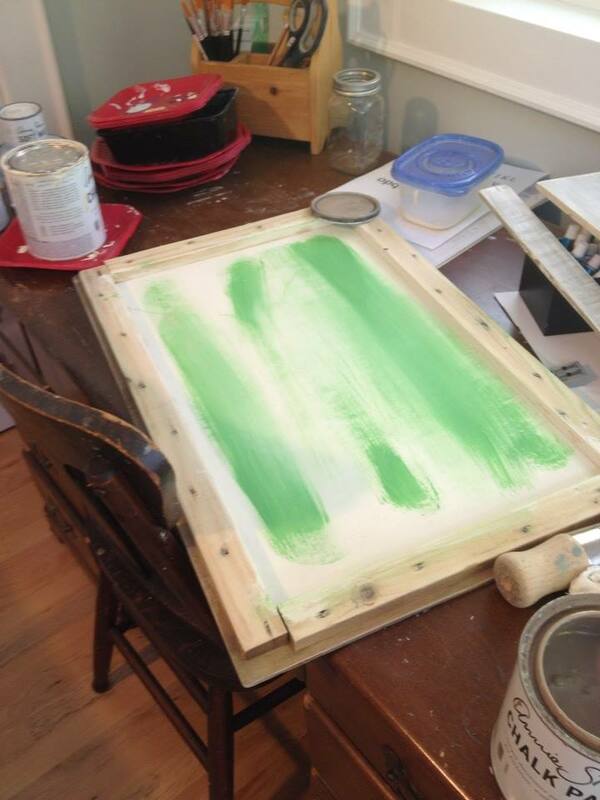 I needed a board with a frame for the base, stencil, paint, sander, paint brushes and a pencil…and that’s it! 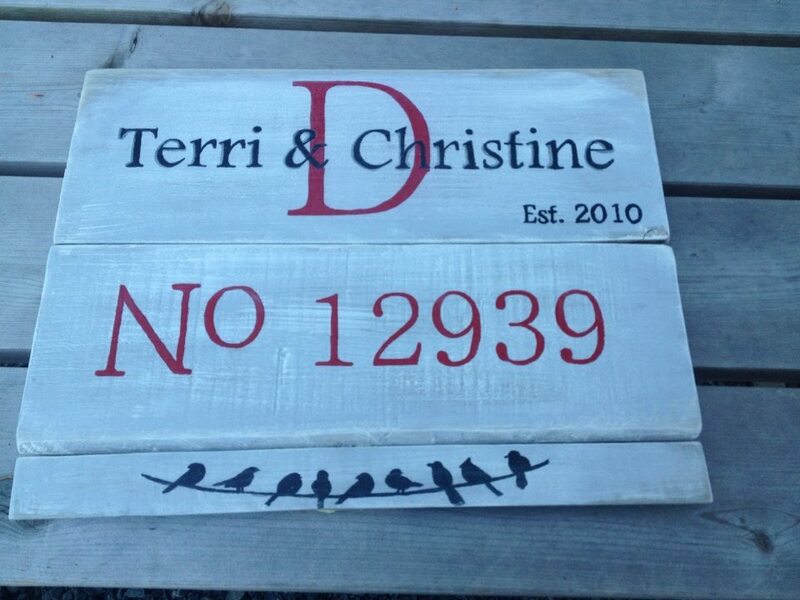 How I did it: I had the lid of an old crate on hand which I used for the sign’s base & frame. 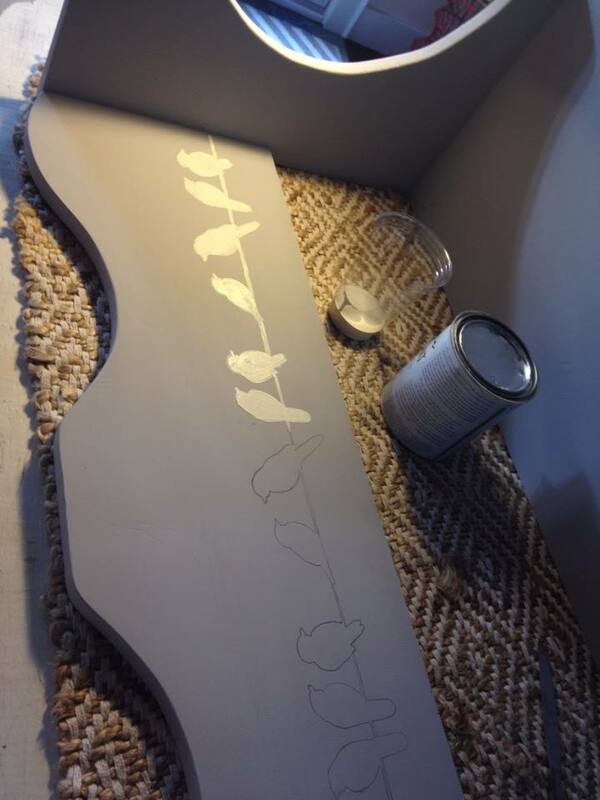 I painted the base coat in Annie Sloan Chalk Paint (ASCP) using the colors Old White and Antibes Green, and Coco for the frame. 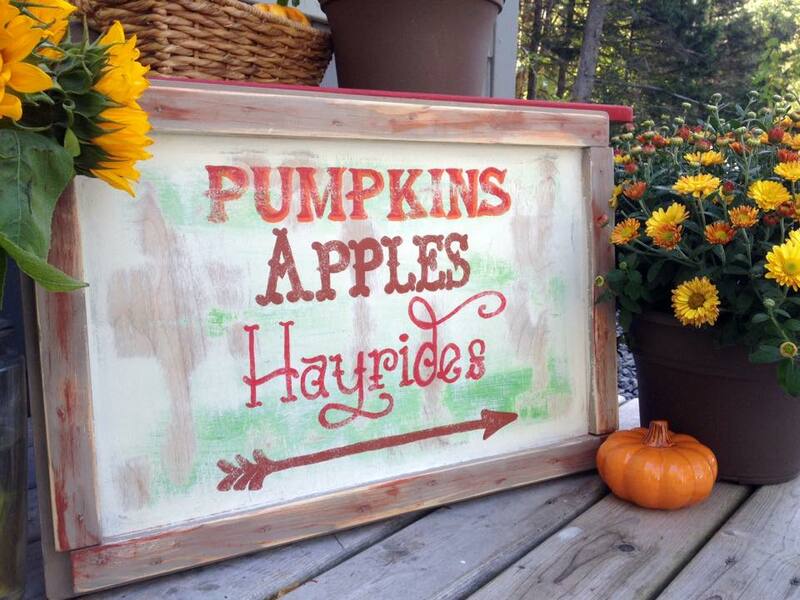 The fun in this sign is that it’s meant to be imperfect, look home-made, and time worn. I LOVE that look!!! Antibes Green layered over top of Old White. 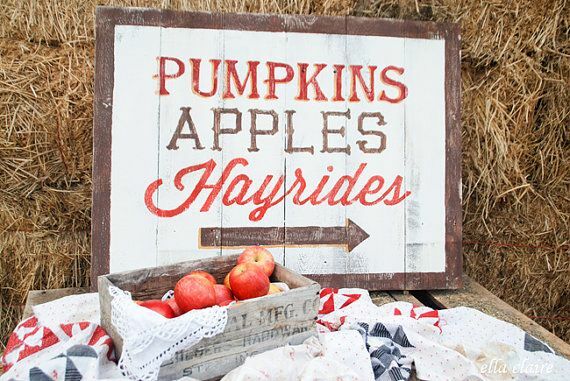 I printed the words “Pumpkins Apples Hayrides” on regular printer paper. 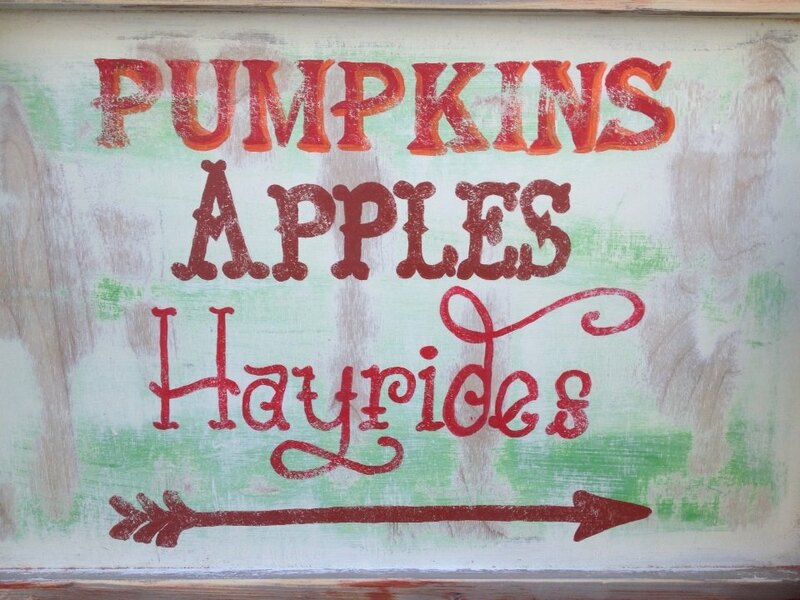 I used fonts as close to hers as I could find, except for “hayrides”…I used a font I liked better. 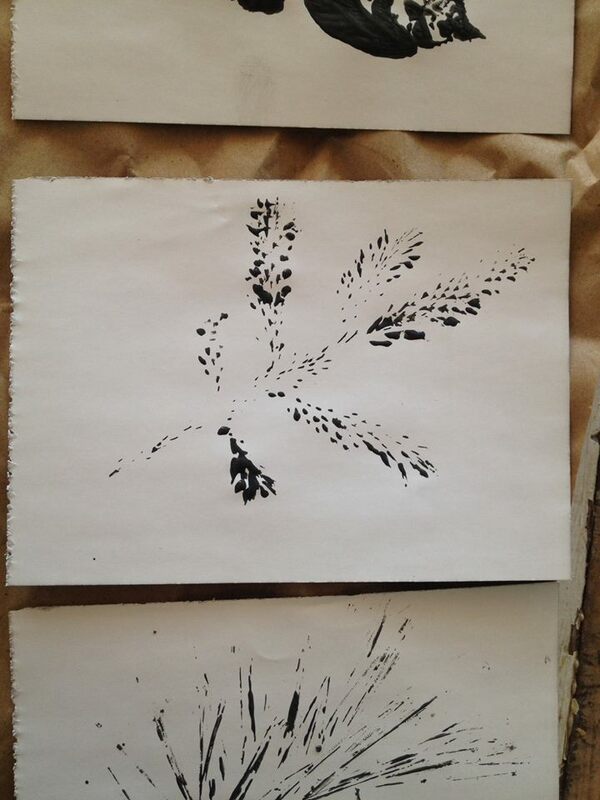 I used carbon paper for the transferring of the stencil (note: but that’s not necessary -you can simply color in the back side of the stencil with a pencil and trace from the front, a technique I describe in my post about the Starfish Bench). I free handed the arrow. Then, I painted it all in. This is the therapeutic part -painting it in! I love it. I had a lady come and pick up a washstand I just finished and she commented on my sign. I beamed, I’m sure! LOL. See you next time. 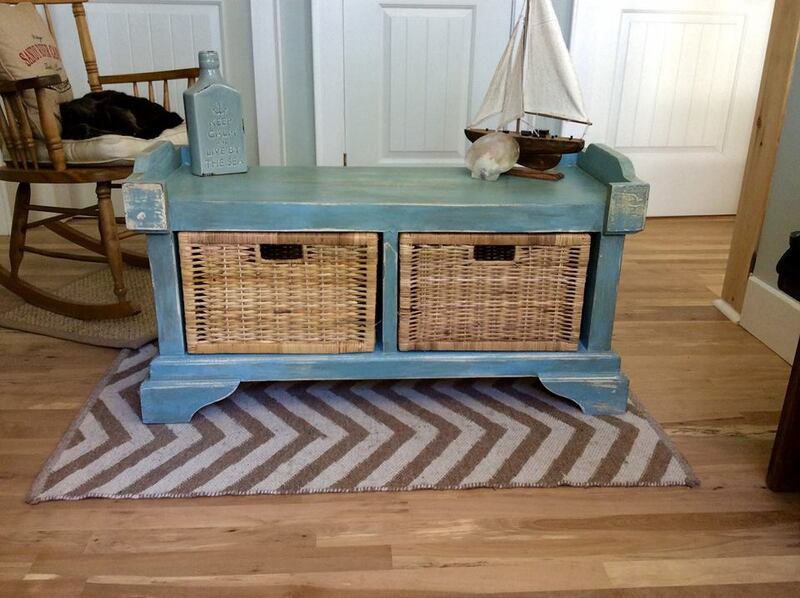 I’ll share some of the furniture I’ve redone lately! Hello, hello! Today was the most beautiful fall day, and I was feeling totally inspired by the sun, the navy color of the ocean, the green-yellow grass tones and the changing leaves around us. I wanted to capture a piece of it all. I wanted to do something unique and beautiful, easy, and budget friendly. 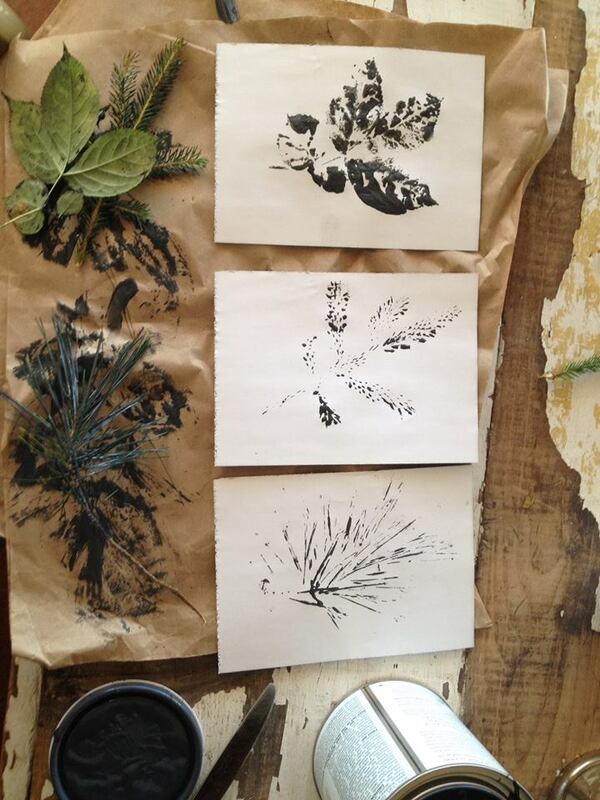 I’ve had this idea for a while now that I wanted to capture “nature prints” -do you remember doing potato prints with paint as a kid? Exactly like that, except with plants, flowers, trees, etc. I had this triple paned picture frame that I bought from Wheaton’s over a year ago that I hadn’t yet filled with photos. 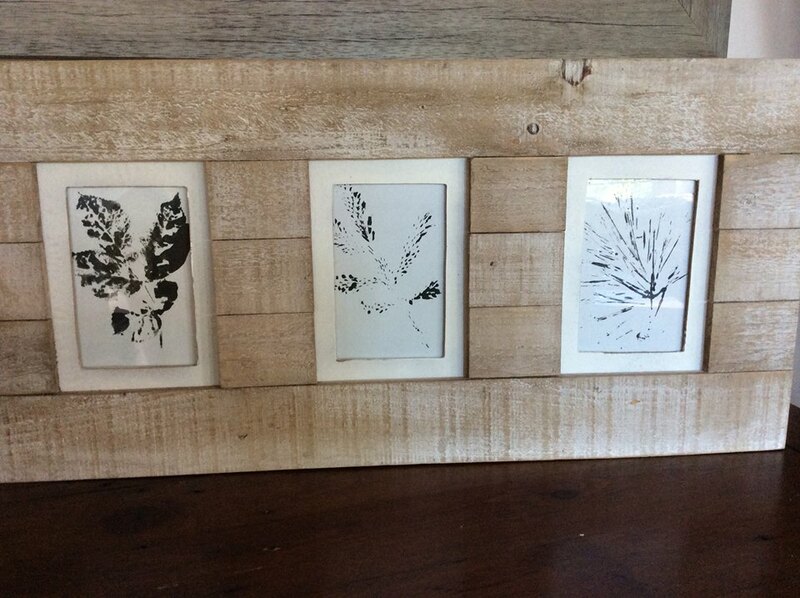 It has a beautiful, wood-planked, white washed frame that I thought paired perfectly with my nature print idea. So, I went on a nature walk in the woods behind my house and picked fir, pine, and a leafy one (not sure what it’s called). 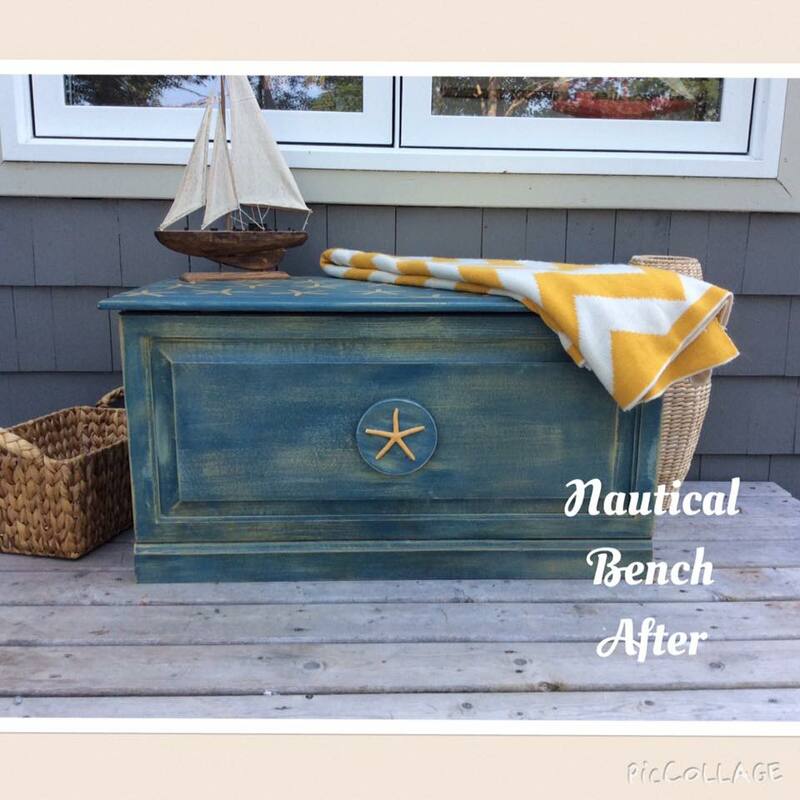 I LOVE Annie Sloan Chalk Paint (ASCP). Just so happens that today I went and picked up Graphite. I decided this would make the perfect color for my prints. You could use whatever you had on hand, no problem! ASCP Graphite -Image uploaded from the internet. What I did was so simple. I took out the generic prints that came with the frame (they were of a barber shop, lol), and flipped them over to the blank side. Then I took a paint brush dipped in Graphite, painted one side of the tree snippet, pressed it down on the sheet, and voila! The first one I did, the fir, I didn’t press hard enough. I decided that was ok and kept it, and just pressed harder for the rest. Here’s how they all looked when I was done. What I LOVE about this project is that I can switch it up anytime I want! This time, I did a tree theme. 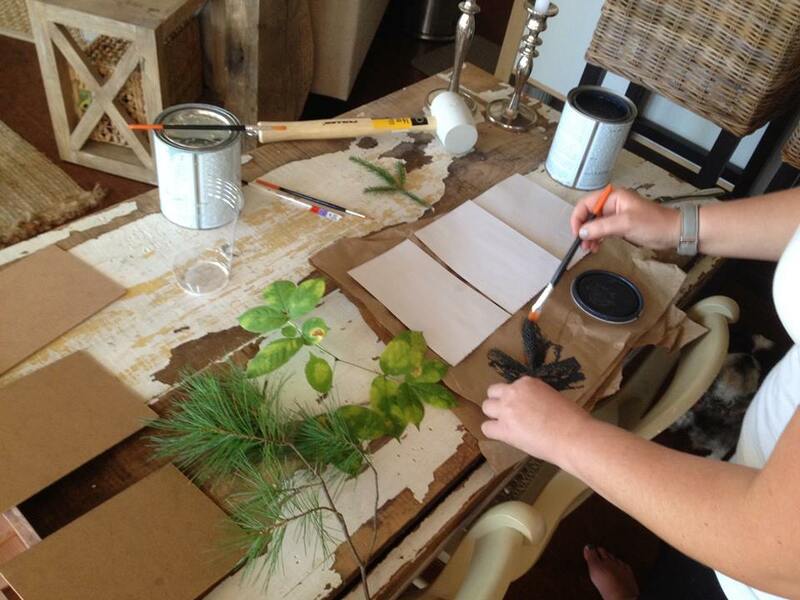 Next time, I could do a flower theme, or a fern/shrub theme….you name it you can do it! In fact, this project could easily translate to the kitchen with lemon, cucumber, strawberry, onion, etc. Change the color of the paint, change the background medium -AMAZING VERSITILITY. Love. I’m happy with the end result. See you next time! Happy painting. Happy Tuesday! I hope everyone had an awesome Labour Day weekend. 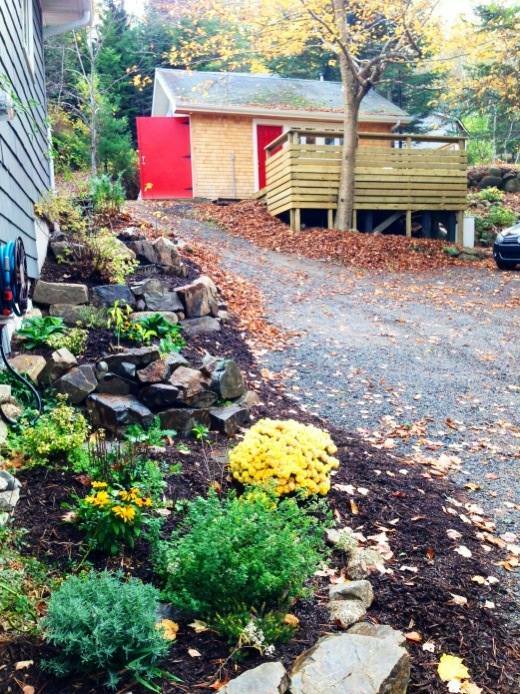 We had amazing weather here in Nova Scotia. I’m completely addicted to painting furniture, so I painted a lot this weekend, but I did manage to fit in some family time with our beautiful dogs. I just finished a bench featuring the most charming birds on a wire. It’s English Country rustic and beautiful! I think it’s my favorite creation to date. 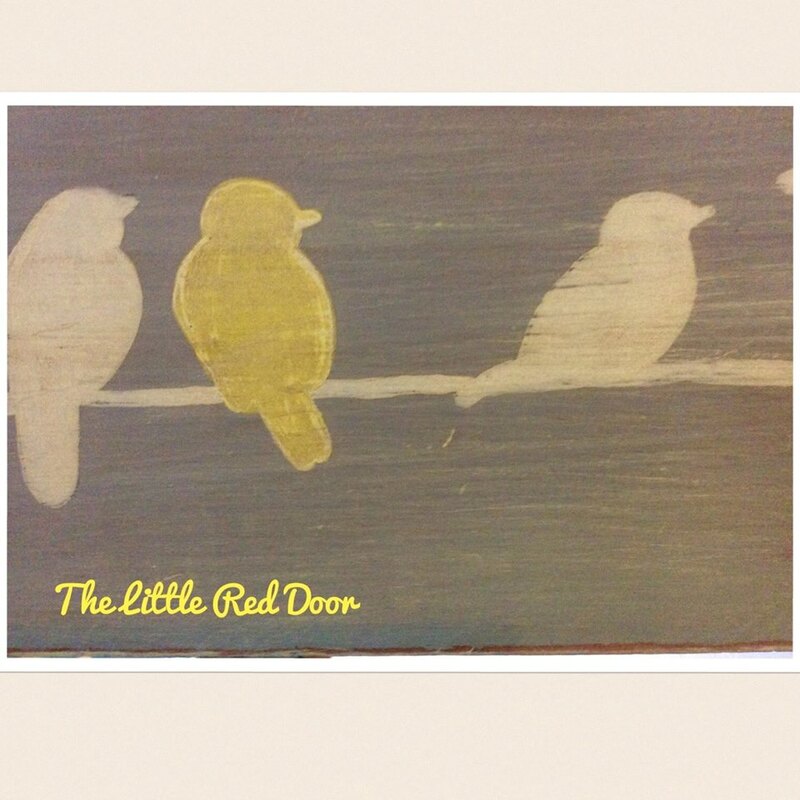 It’s painted in (my favorite) Annie Sloan Chalk Paint (ASCP) Paris Gray & Cream, and the birds are stenciled and hand-painted in Old White and English Yellow. Here it is! I accidentally deleted the ‘before’ photo which is such a shame because I really wanted to show how terrible it used to look. 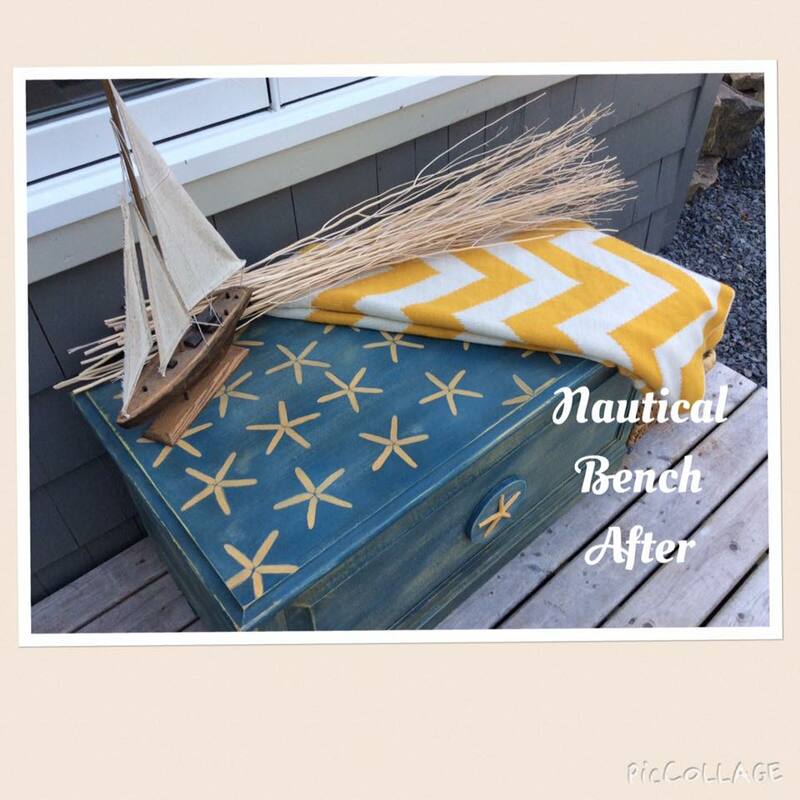 This bench is solid pine and it had bright orange stain over the natural wood with plenty of knots, and a split across the bottom front which needed repair; it gave it a crooked line and a sharp edge. The orange stain was so ugly…and it came back to haunt me, too…but I learned a valuable (and obvious) lesson that I’ll share. 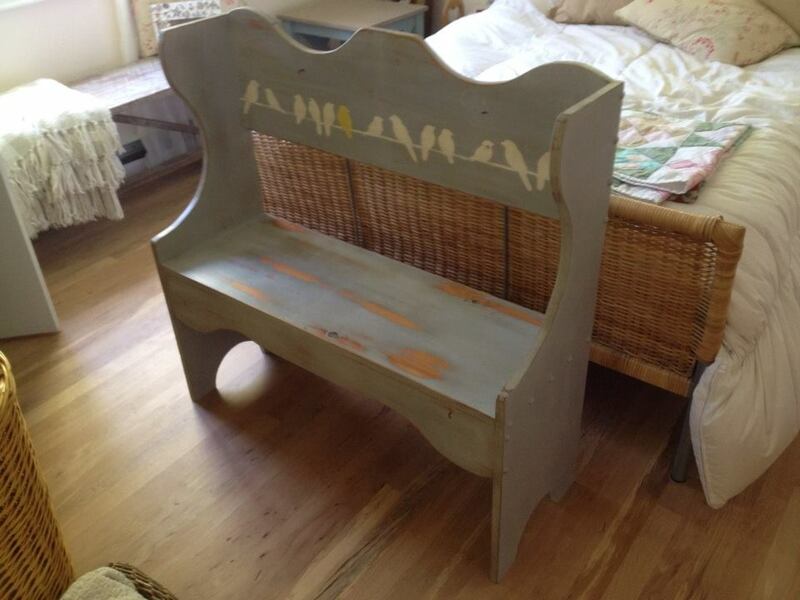 To start I gave the bench 2 coats of Paris Gray. It covered really well, as ASCP does. 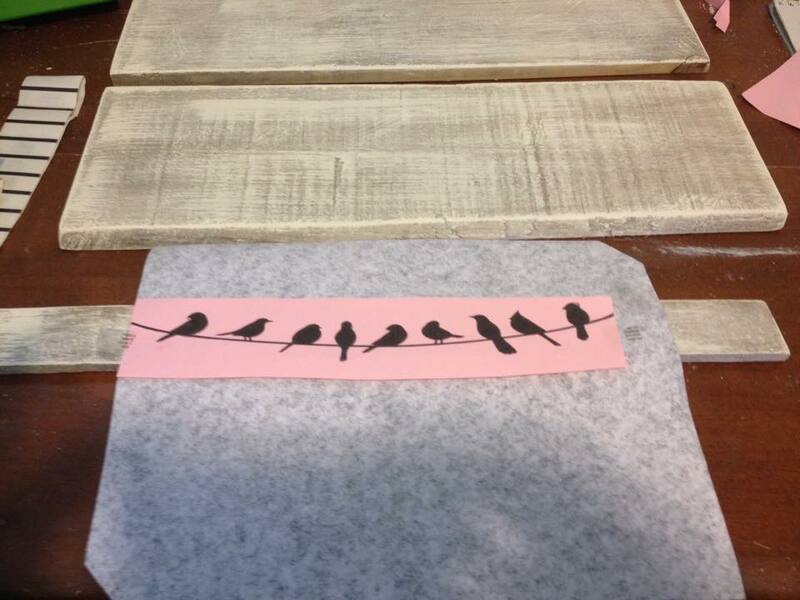 Then, I found a birds on a wire stencil that I loved on Pinterest. I saved the stencil to Word, blew it up to size, printed it on regular paper and transferred it to the bench using carbon tracing paper. I wanted the bird pattern to be original and varied, so I decided to trace the pattern in both the regular way AND in it’s mirror image, and then I varied the placement. I love how it turned out! 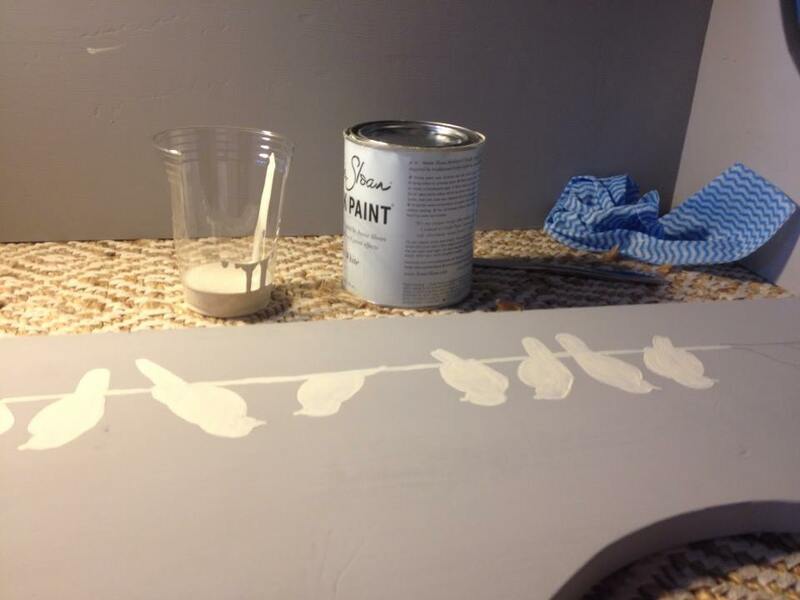 Next, I hand painted the birds in with two coats of Old White. I used a number 6 acrylic paint brush for the outline and a number 10 to fill them in. I went back in and painted one of the birds English Yellow. 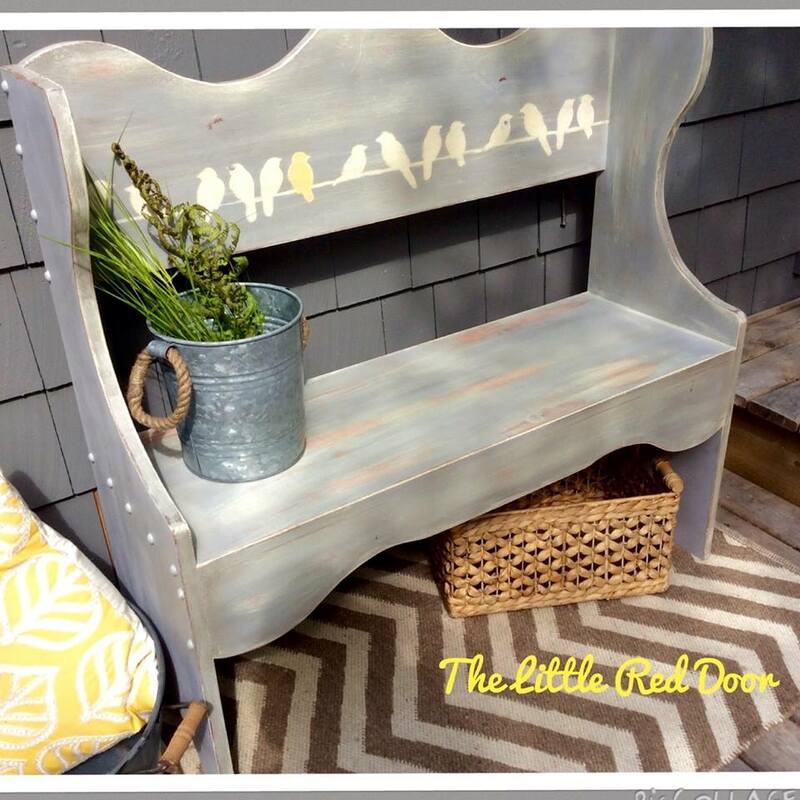 I had planed to do a single yellow bird from the minute I saw the bench…I had a really clear image in mind for this bench! BEFORE I fixed it up -ugly orange exposed and over-whelming sanding. After a night’s sleep I woke up early, ready to fix it with a layer of Cream paint. I was trying to decide between a wash of Cream or a dry-brush. I consulted good ol’ Pinterest and decided on a dry-brush. With a deep breath and a little prayer, I went ahead. 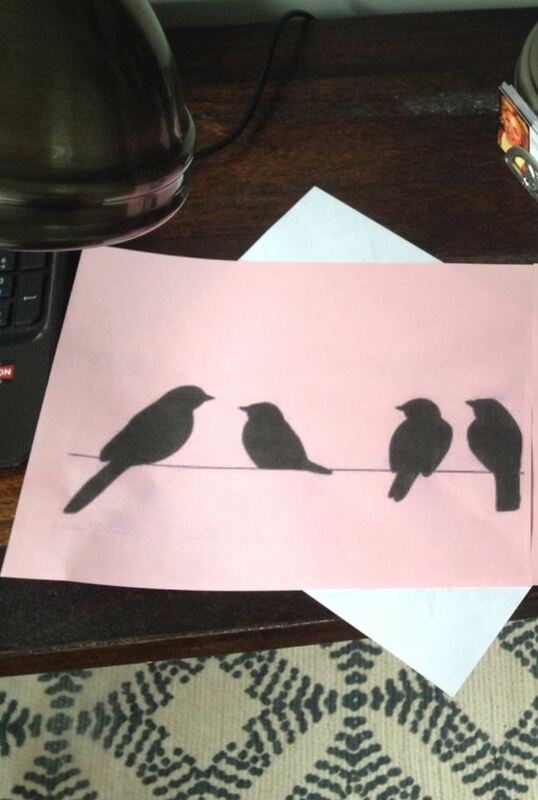 So much work went in to this already (the painstaking birds!) and the thought of starting over was disappointing. I’m so grateful. Here I sit, at my computer, in my office looking at the ocean with my little dog on my lap, drinking morning coffee, sun shining. I’ve already painted two pieces today. I feel relaxed, excited and happy. It’s Sunday morning. I believe in hard work -and I also believe equally in living your life. After losing my Dad in 2010 to a motorcycle accident, I realized time with loved ones is the most precious thing of all. It was the most profoundly emotional, impactful, eye-opening and heart-wrenching period in my life. I started on a quest for balance and happiness, asking the question: What would my ideal life look like? Over the past few years, we’ve been working towards our ideal life! 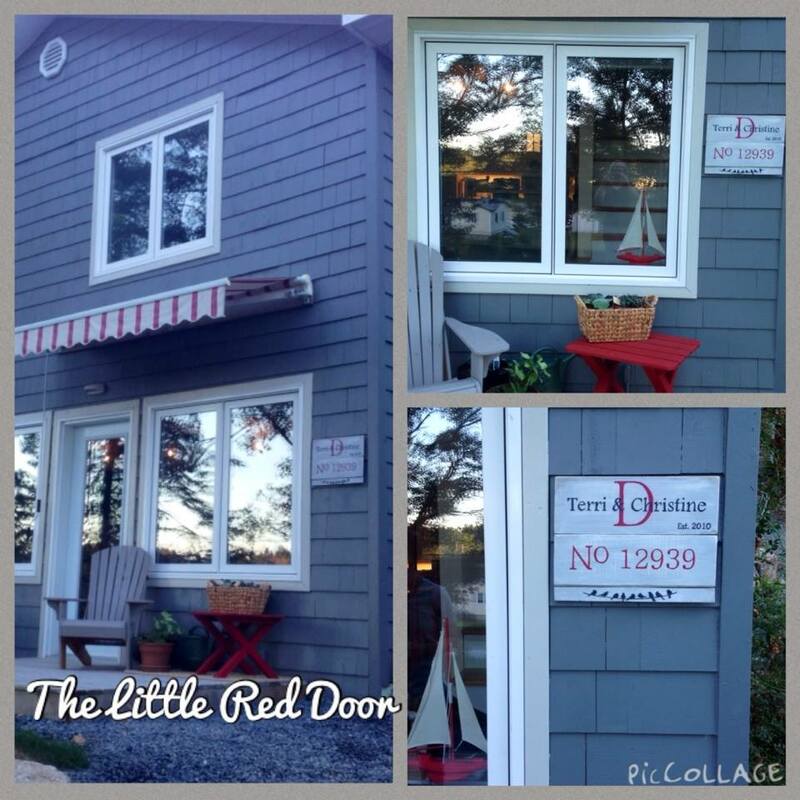 Moving in to our dream home here -a small, cozy, cottage-like home by the sea with our dogs (you can read about that move in earlier blog posts) is part of us living out our ideal life, and it is also how the The Little Red Door got started. This house had a second building -fancier than a garage, not as fancy as a house- with a red door and cedar siding. We started dreaming up things to do with it. 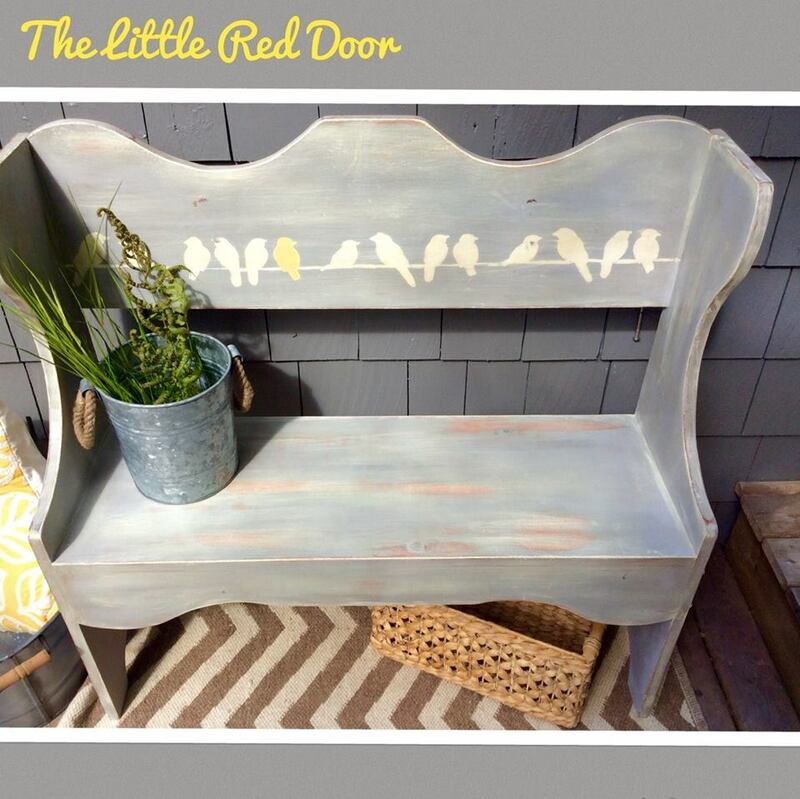 The constant inspiration of the red-door-cedar-sided-building kept my imagination in constant motion and it finally evolved to me taking the plunge and doing something I’ve always been passionate about -home décor. And thus, the journey begins, named after the sweet little red-door building that started it all. 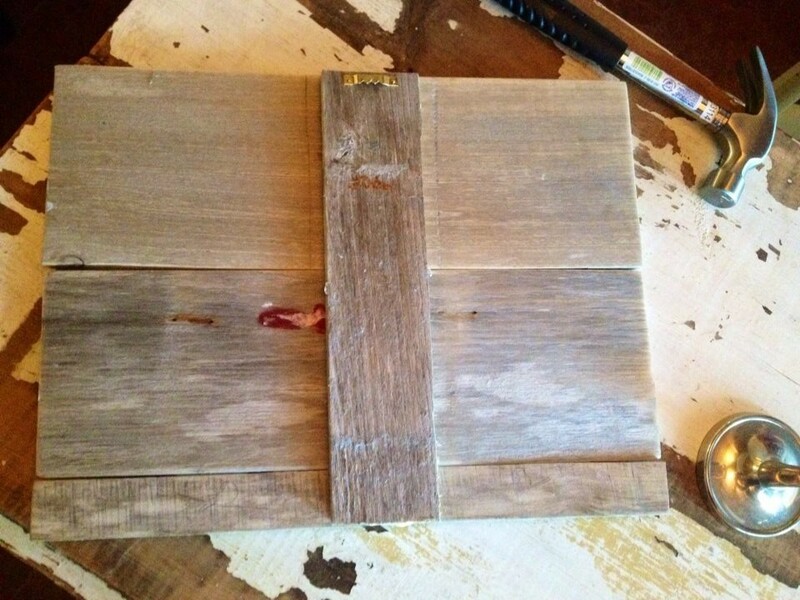 So, we hit the reclaimed wood jackpot! 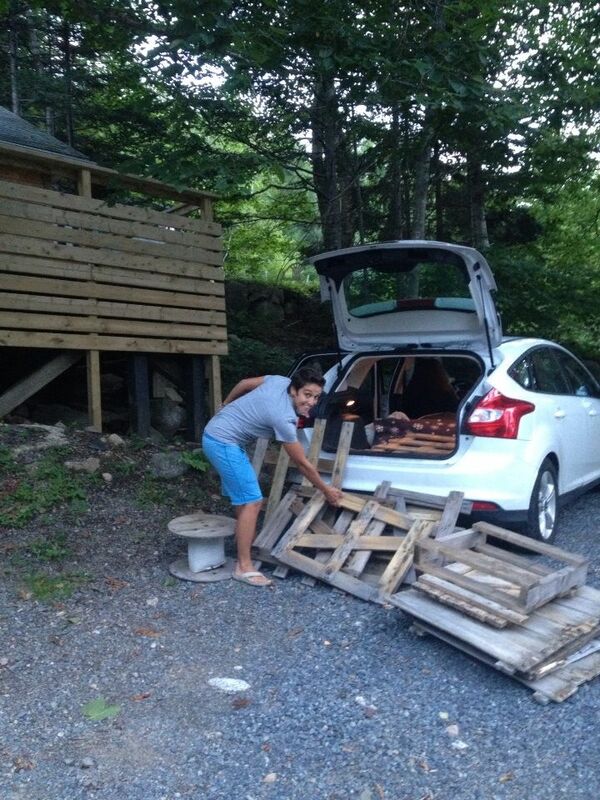 An ad on kijiji said “free” wood so we decided to check it out. There was a variety softwood, hardwood, palettes and all kinds of other good stuff. 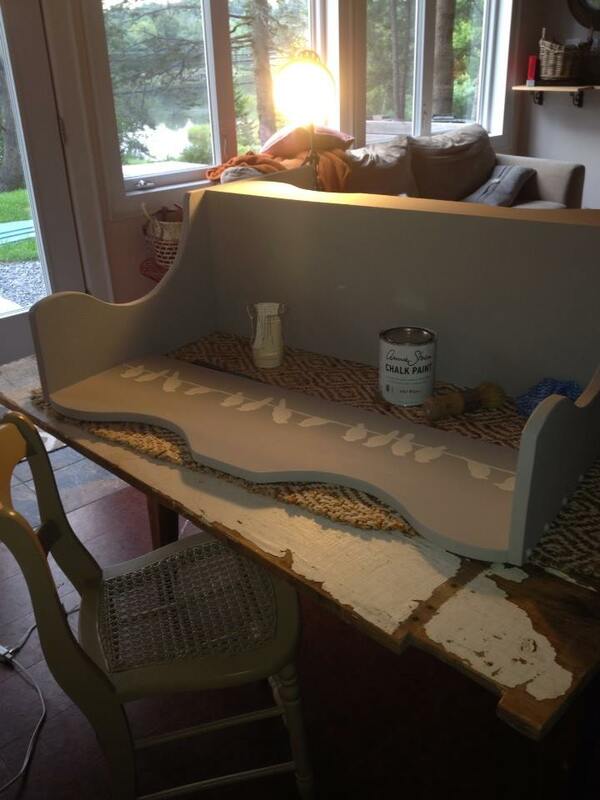 The catch was that there were nails sticking out and we would have to take everything apart ourselves…..no problem!! 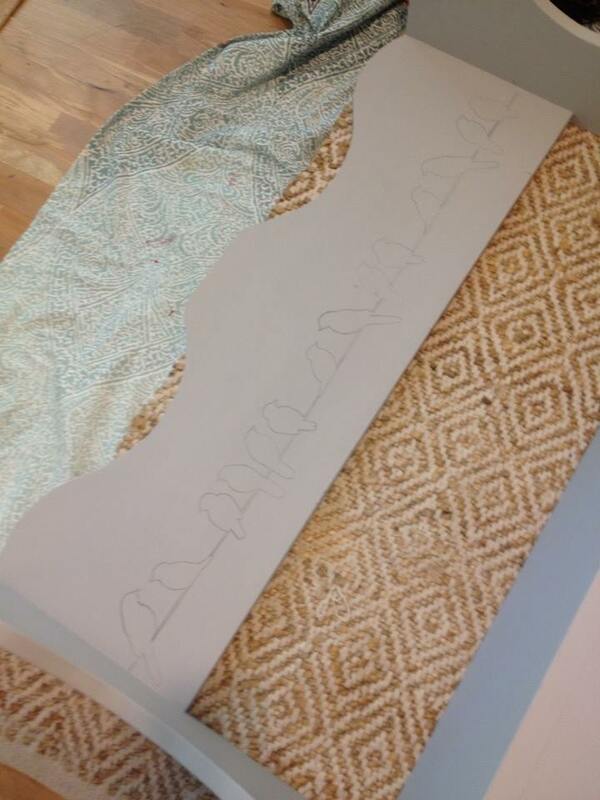 I knew exactly what DIY project I wanted to do: sign making! 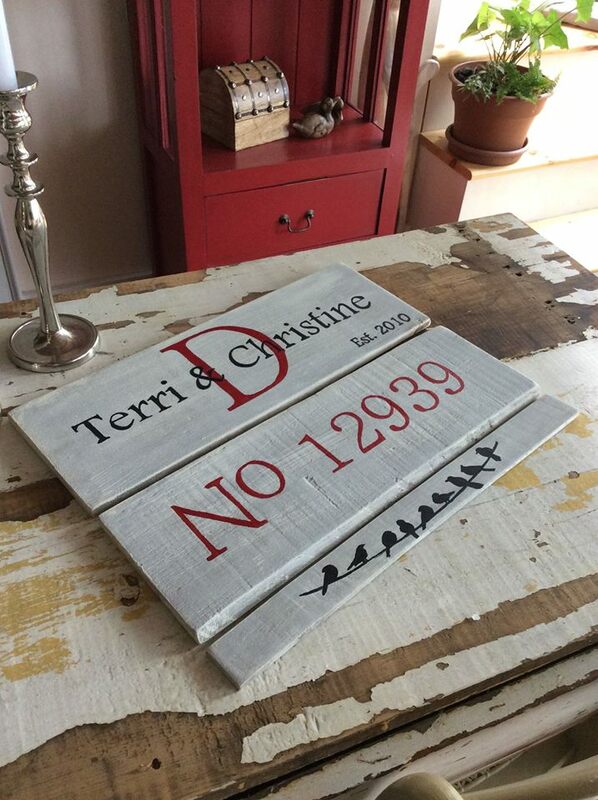 I love the quality that reclaimed wood brings to a quote, monogram, picture or print: deliberately disproportionate, rustic, uneven, character, charm -GOODNESS! 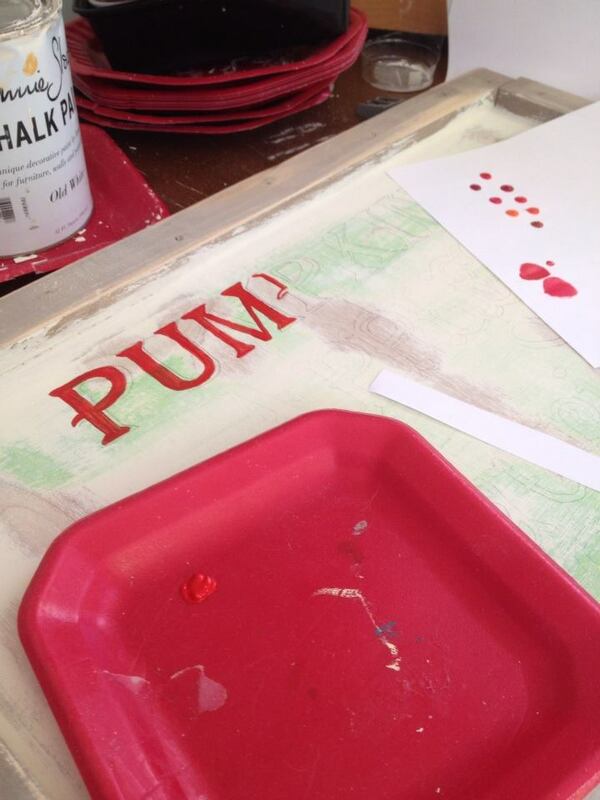 I love the process of sign making even more…finding the inspiration, choosing the colors and design and layout, printing the stencil, and painting it all up…I find it soothing. Hours go by and I’ve been happy, content and in the moment. I love that feeling! So, I decided to do my first ever sign based on what I know best: my own house and likes. We just moved in to our little dream house, and we are still making it our own. I wanted to increase the curb appeal of the front and add a personal touch. A monographed sign would be perfect. 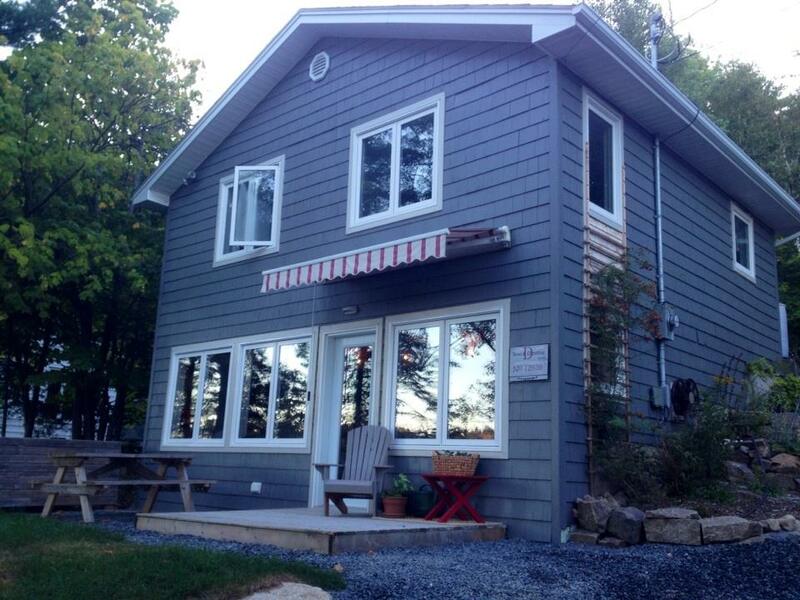 Our house is a beautiful blue-gray with beige trim and red accent in the awning. I wanted a rustic, weather worn look with a little pop of red peeking through. I watched a bunch of YouTubes to get a feel for the best way to go about my new project and choose the method I thought would best suit me & my budget …and then I got to work! I started by having the wood cut to size by my handy other half (I am definitely not power-tool handy). I used 3 pieces to make up my sign, and made one of them a totally different size for quirk and character. 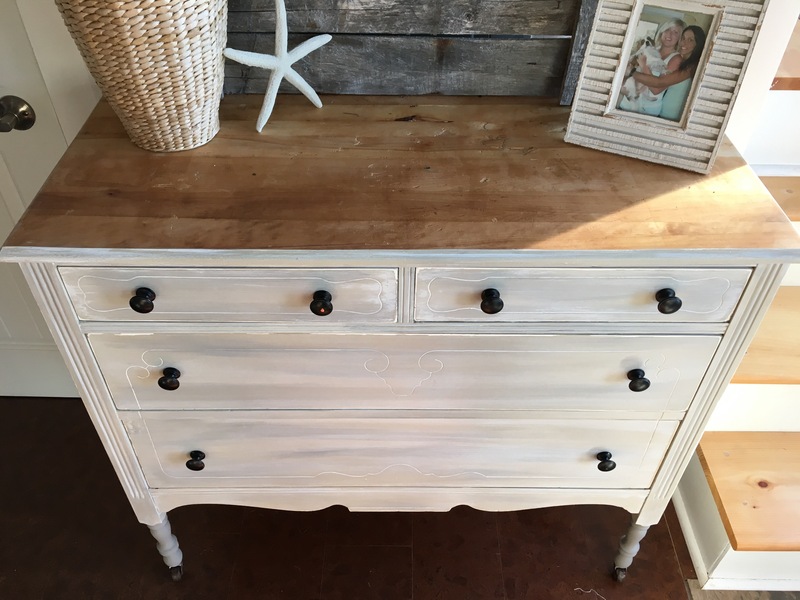 I gave it all a coat of Annie Sloan Chalk Paint (ASCP) in Old white, and dry brushed over top of that with ASCP in French Linen for a distressed, aged look. Then I chose fonts and colors. I printed everything on regular printer paper and transferred it to the sign using carbon tracing paper from Staples. 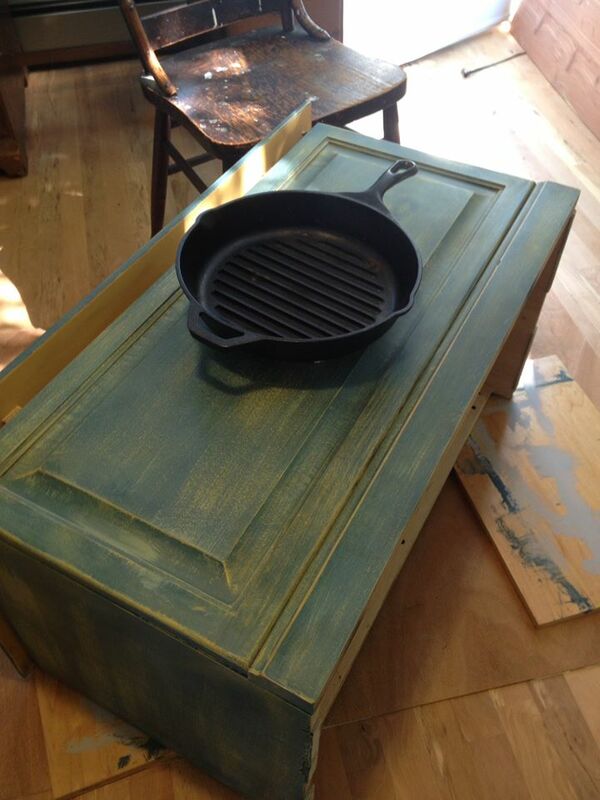 Then, I painted it all in with acrylic paint and finished by hand-sanding the edges (particularly the top). 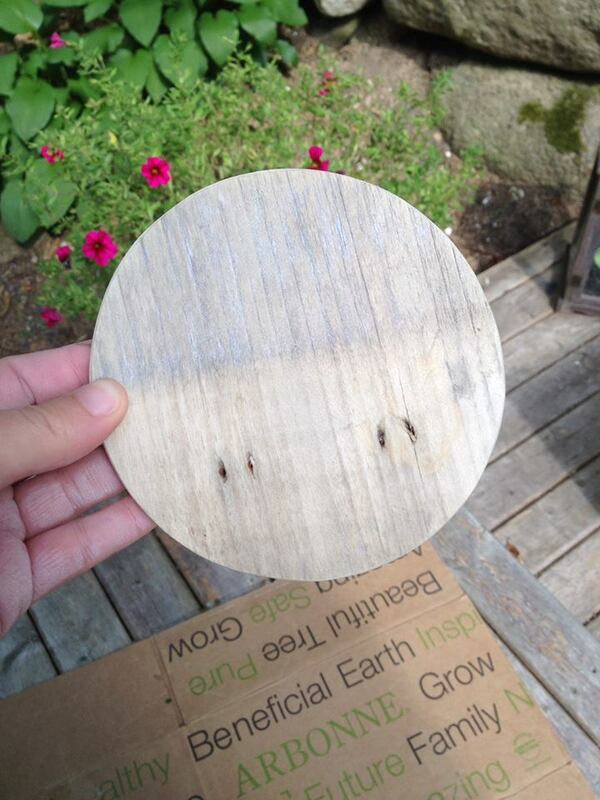 I attached it together by using Gorilla glue and a single piece of wood down the centre of the boards. Then I added a little bracket thing. I’m so excited for the next chapter! 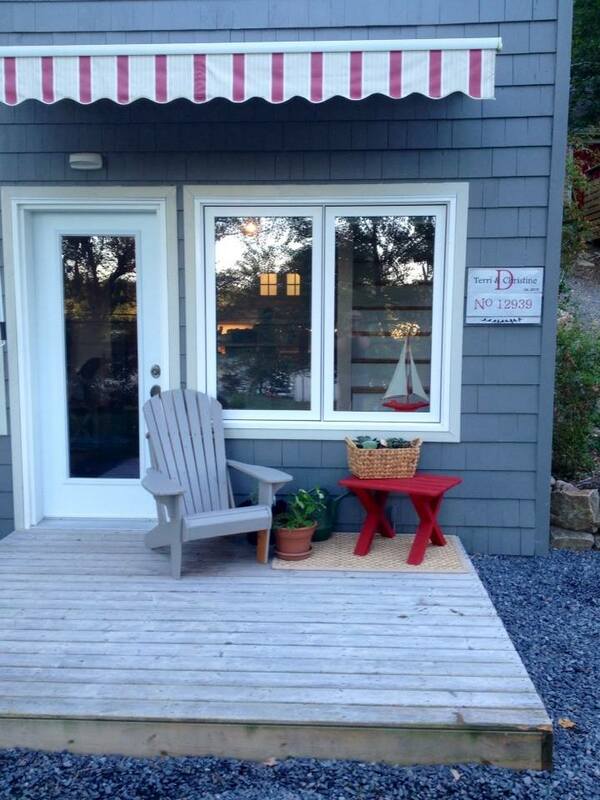 I’m a new blogger living in the heart of Nova Scotia, on the water near Peggy’s Cove. 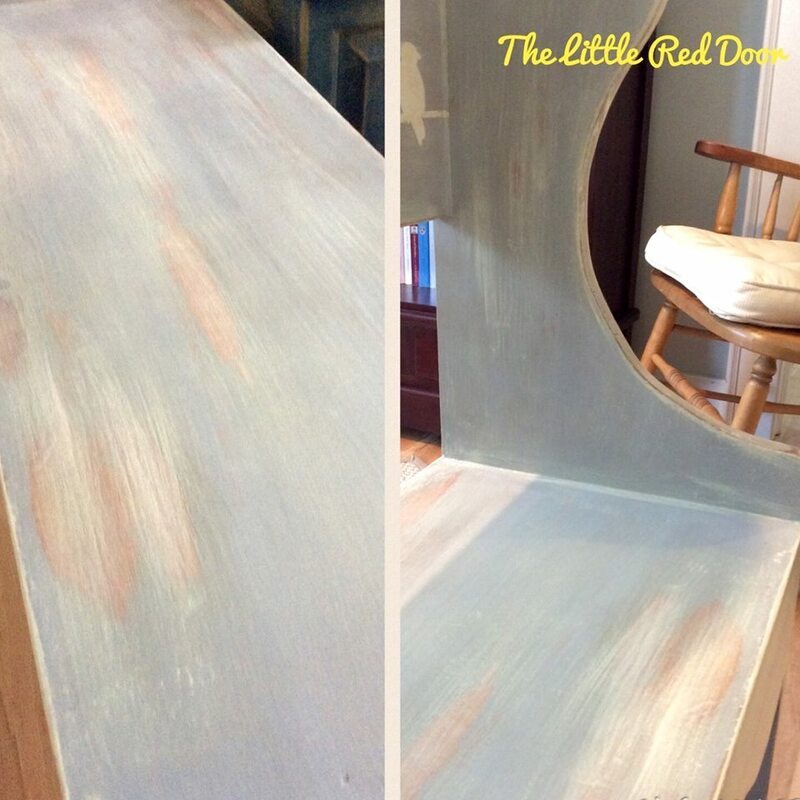 I’m blessed to have found my passion -upcycling furniture. 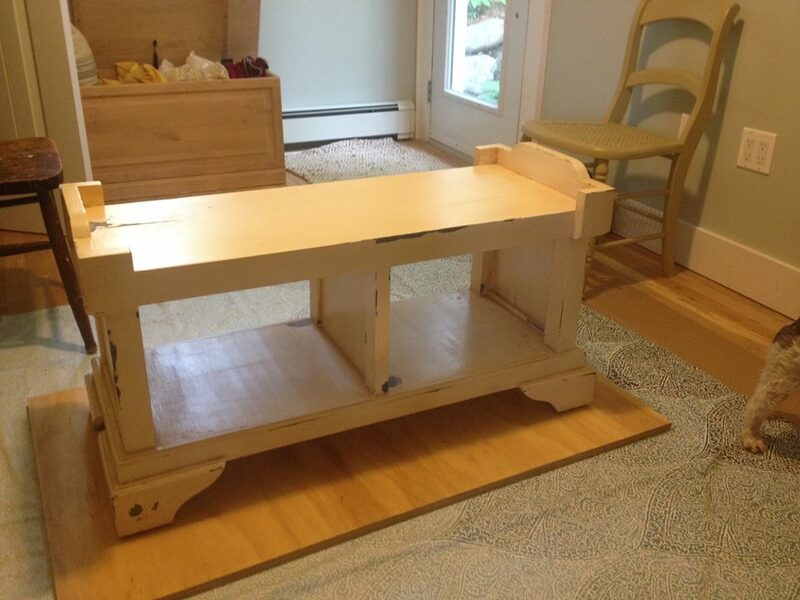 I find absolute joy in the process of hunting for amazing, unloved or unwanted furniture, taking it home, looking at it until it speaks to me (furniture tells me exactly how it wants to look, I swear) and then starting the process of sanding, priming, painting, taping, stenciling, waxing, sealing and finally … reintroducing it to the world! My most favorite thing to be inspired by is nature and all its elements. Everywhere I go, I see possible color combinations. It’s a never-ending palette of possibility. I’m forever writing down notes all over the place of what colors I want to use together next. Right now: grass-green and coral inspired by a piece of sea glass laying next to a crab shell I found walking on the beach -it was magic! 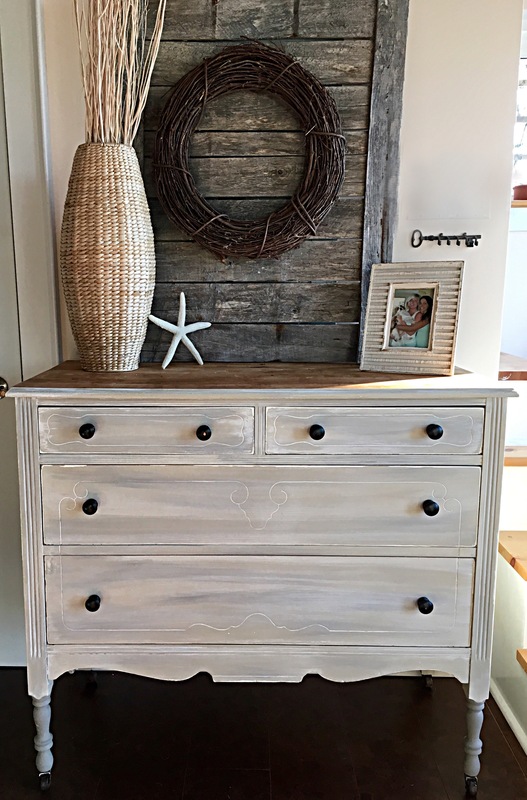 There is no one way to describe my furniture makeover style -I’m quirky, serene, regal, fun, soft, loud, sophisticated and playful. 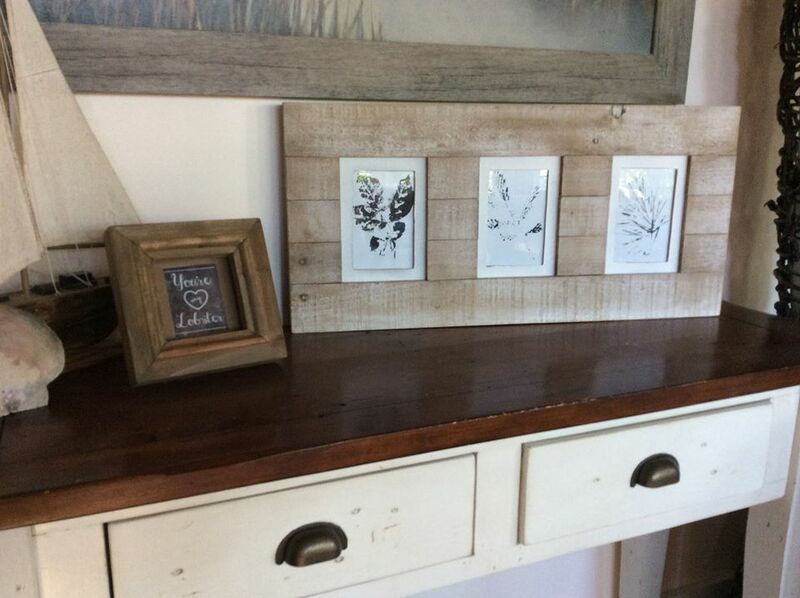 My two favorite home décor styles are English Country and Costal so I tend to gravitate towards these, and overall I’m a blend of “rustic-cottage-farmhouse-beach house” type things. But I don’t like labels & boxes….so I’ll not limit myself there. Expect variety! 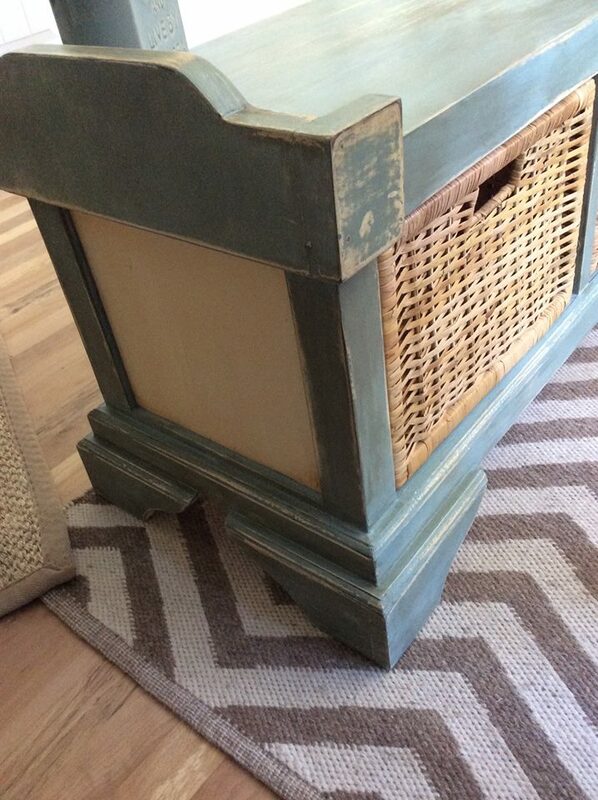 Right now I’m HEAD OVER HEELS in love with Annie Sloan Chalk Paint (ASCP). The color palette is limitless if you are good at color mixing (which I am) and the wax finish gives maximum durability. 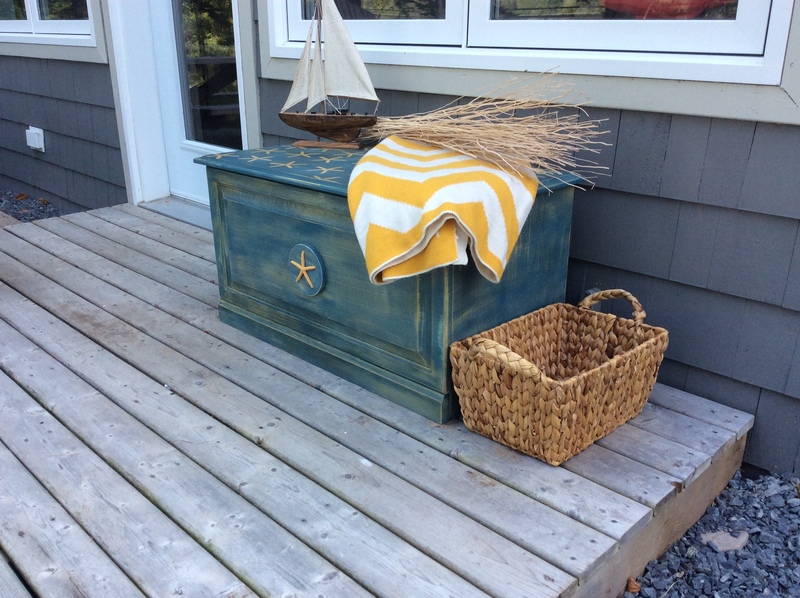 I just finished a nautical bench; I call it the Starfish Bench. I transformed a plain, under-whelming pine bench with a cedar plank bottom. 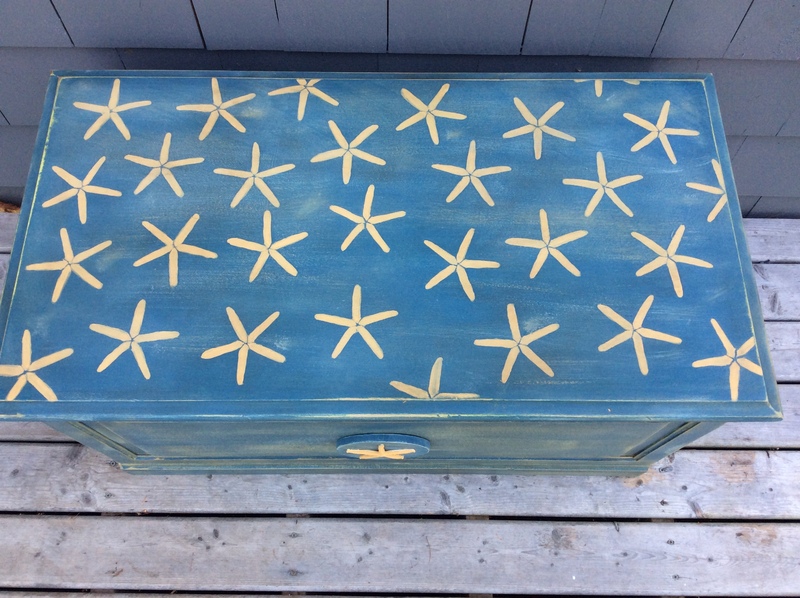 It was SO drab that I couldn’t help but stencil starfishes all over the top. It asked for it. 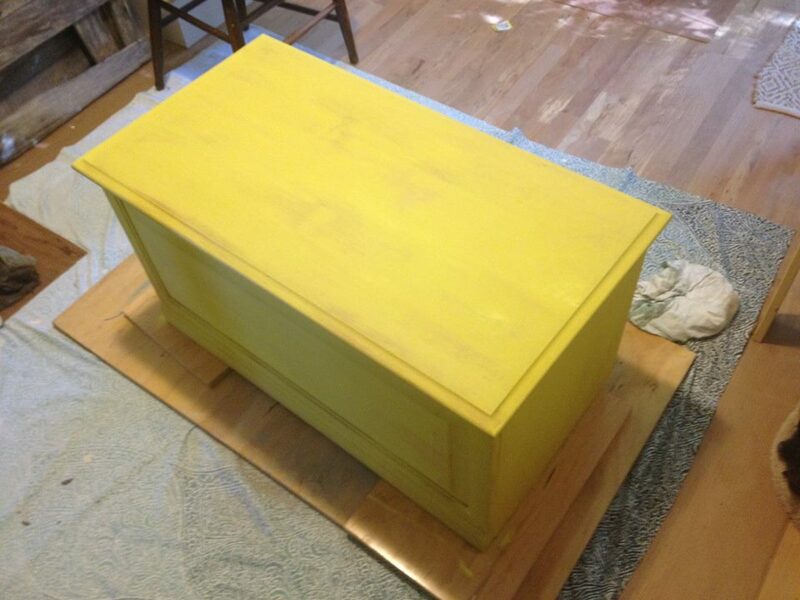 I started by giving it a coat of English Yellow because I knew I was going to distress it, and I wanted this gorgeous color to come through. 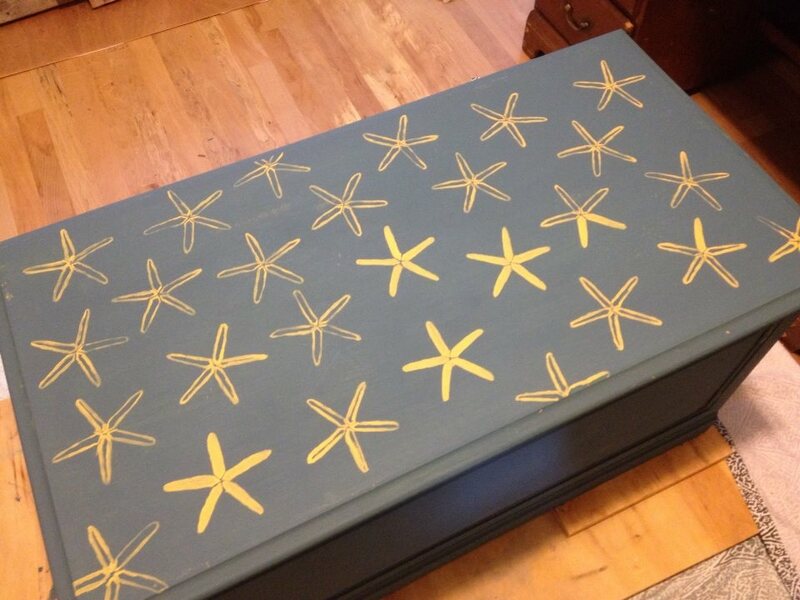 Then, I added a coat of Aubusson Blue and printed out a starfish stencil I found on Pintrest. I just used regular paper, colored the back of the starfish print out with watercolor pencil in white so it would show up against the blue, and traced with medium pressure to get a little indent in the wood. Nothing fancy, worked great. 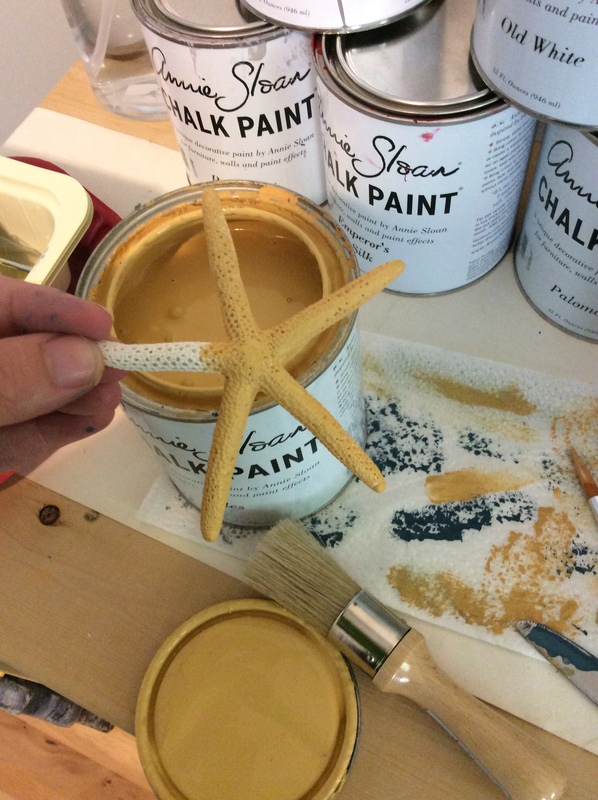 Then, I painted the starfish by hand in Arles using a number 6 acrylic paintbrush. 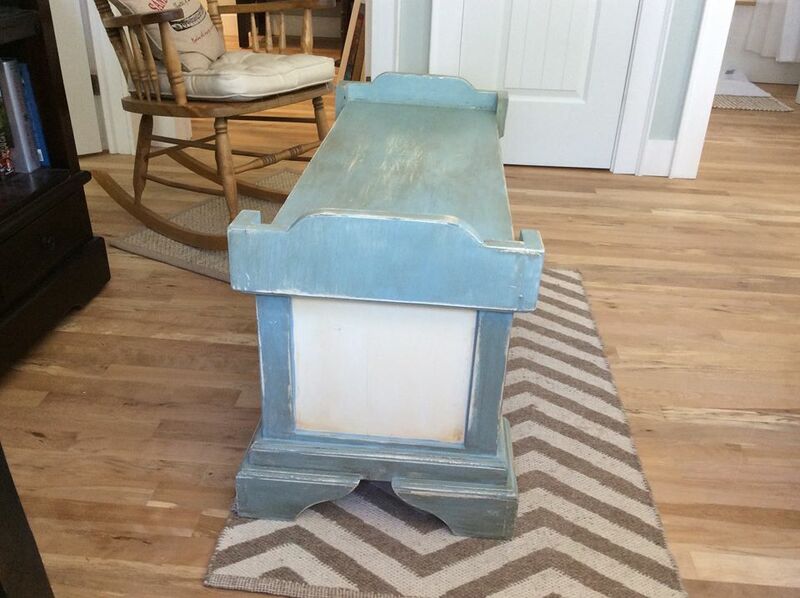 Then, I dry brushed Duck Egg Blue and Arles over top to get a weathered look before distressing. Even after all that, it was still plain. 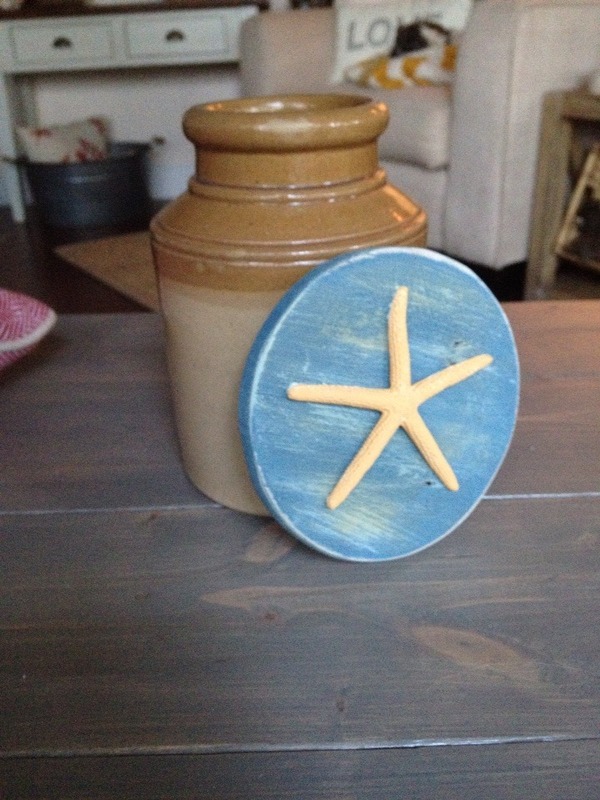 My mom said “there’s something missing” and suggested adding a “real” starfish to the front. So, we cut out a circle from re-claimed wood, I gave it the same treatment as the rest of the trunk, painted a starfish, and glued it on to the circle, which in turn got glued to the trunk, using Gorilla wood glue. I used a cast iron pan for the “clamp” -worked really well! 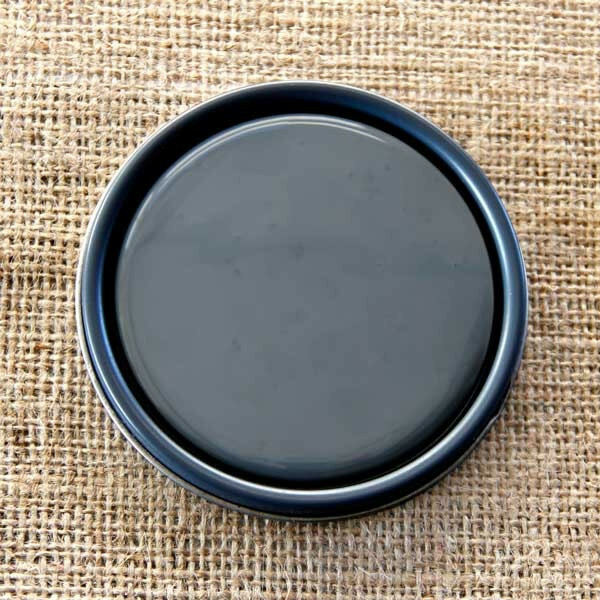 Then, I waxed the whole piece in Annie Sloane clear wax, twice, added a coat of dark wax, and buffed. Voila! As a grown up, I’ve owned 4 separate homes and an apartment, and decorating my space is something I’m passionate about. I look at a space, and suddenly a “vision” for what it needs flashes inside my mind’s eye and -a passion is born to transform the room so it can live up to the vision! Sometimes, the things I want for my space are no where to be found, or if I can find what I want, it’s out of my budget. 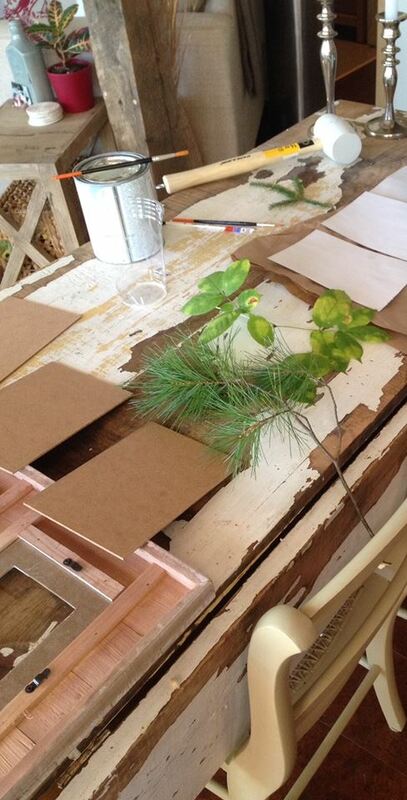 That’s how I discovered my love and talent for making over previously loved furniture. The same thing happens -I see the piece and bang -the vision is born. Since moving in to our little house by the sea, I’m more inspired than ever! The ocean views from almost every room, the character of the property, the gardens, the wild life, the 3 sheds (lol) …this all inspires me and lights my creativity on fire. I can’t help but throw myself in to my passion for creating beautiful spaces and furniture! Here’s my first creation! 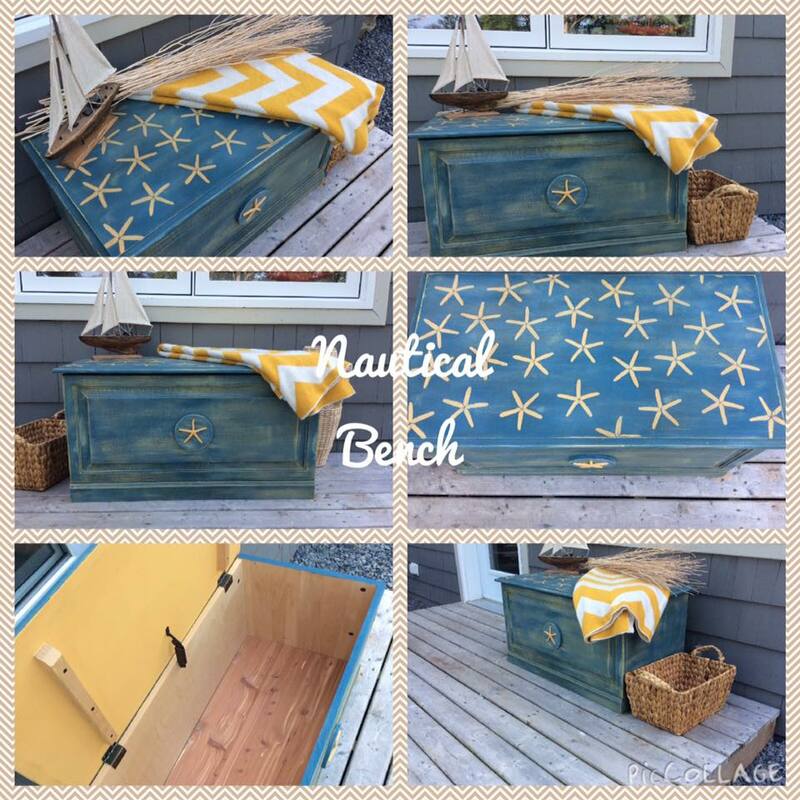 The nautical bench.